Much of the morning on a game day at Michigan Stadium is quiet. Some kitchen employees arrive at 3:00 a.m. The equipment staff is also in early to prepare players' lockers. The equipment staff tries to organize the gear as much as possible, so the players "don't have to think whatsover," says Head Football Equipment Manager Sonny Anderson. 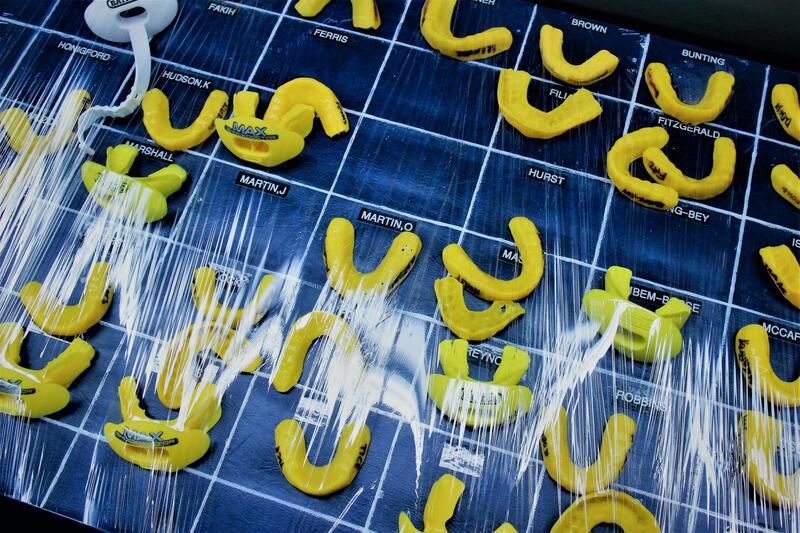 Just outside the Michigan locker room, there's a table with a square for each player's mouth guard. A stadium staff member delivers jugs of water to the sidelines about five hours before kickoff. Michigan Stadium has only one tunnel, so traffic can tricky before and during games. The game day rundown is scheduled down to the second. It's also posted in the press box to help reporters and camera crews. 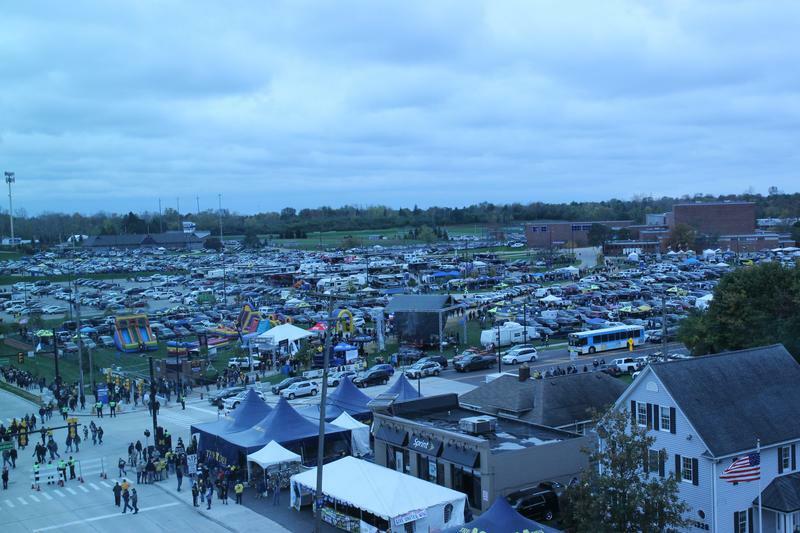 Hours ahead of game time the grounds at Ann Arbor's Pioneer High School become a parking lot for Michigan football fans. Pre-game games at a tailgate party across the street from the Big House. Coach Jim Harbaugh and the Wolverines arrive about two hours before game time. The full team takes the field for warmups about 45 minutes before kickoff. The Michigan Marching Band, 400-plus members strong, is longer than the tunnel into the stadium. The tail end of the group is almost in the parking lot. Show time. Michigan players touch the banner as they take the field a few minutes before kickoff against Rutgers on Oct. 28. 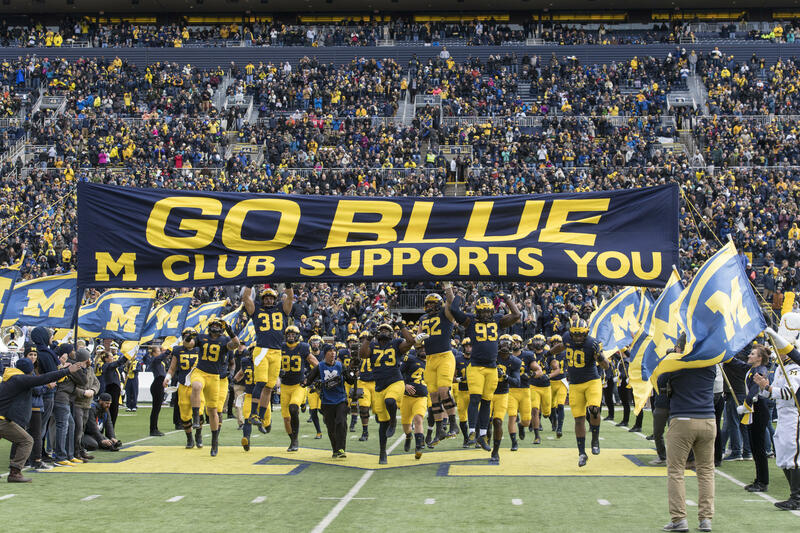 There are more than 400 staff members and volunteers who get the Big House ready to welcome more than 100,000 fans on game days. Ruth Brown is one of the many people who makes an early arrival. We met Brown on the elevator she operates. She's a fixture at the stadium, shuttling guests, staff and reporters where they need to go. I asked her what she likes about being at the stadium early? 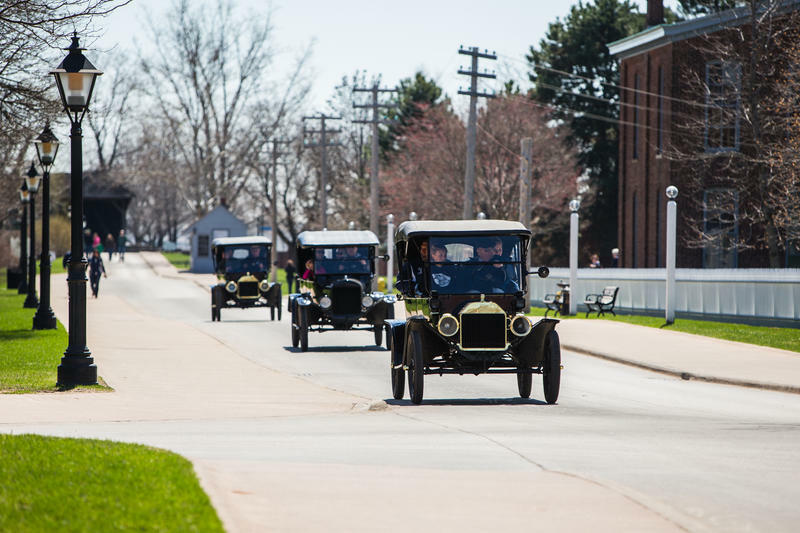 Today, Brown arrived at 6:45 a.m., more than three hours before the gates even open. 7:00 a.m. Pregame morning meeting for several department managers. This meeting is always held five hours before kickoff. Events Manager Jay Brummel opened the meeting with a weather forecast. "It’s like a high of 46, low of 30, chance of rain has dropped at kickoff, so that’s good news." 7:10 a.m. Head football equipment manager Sonny Anderson is back near the locker room. His staff touched up the paint on the Wolverines' maize and blue helmets by hand last night. 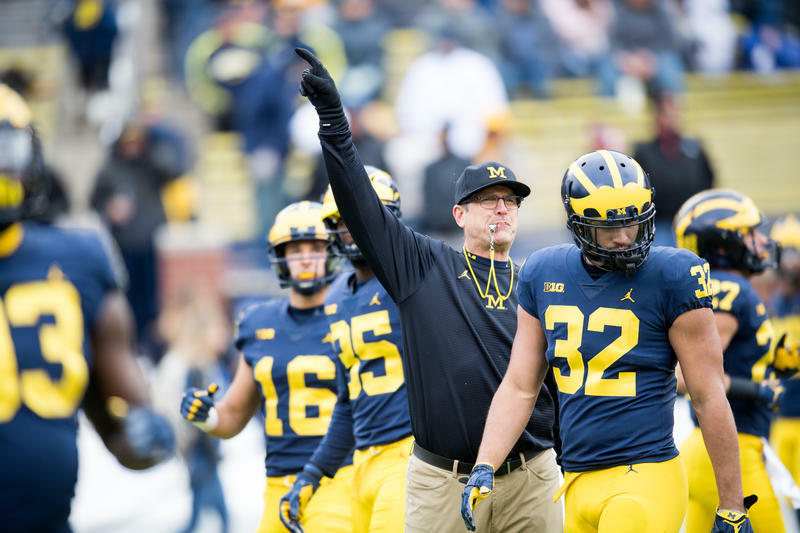 (Coach Jim Harbaugh has players use the same helmet for practice and games.) Now, they're putting out the rest of the gear. "We want to have everything set for them, jerseys on the shoulder pads, specific gloves out, their right game cleats, really just take care of them, so they don’t have to think whatsoever." 7:51 a.m. In the tunnel entrance to the stadium, crew members are loading gallons of water on to a cart that’s being pulled by a John Deere tractor. The water for players travels through this tunnel and so does everything and everyone going to the field. Unlike most stadiums, the Big House has only one tunnel and it’s located in the middle of the visiting team’s sideline. Kurt Svoboda, UM associate athletic director for external communications and public relations, says that’s why tunnel traffic is highly choreographed. 8:30 a.m. By now Senior Facilities Manager Paul Dunlap and his crew have been here for three hours. Their work includes everything from grooming – yes, grooming – the artificial turf (to make sure it's not too hard) to prepping the bathrooms. They also keep the lights on. That was a problem for one of Dunlap’s predecessors when the power cut out in part of the stadium before a game in 2012. "We were able to get it partially repaired," Dunlap said, laughing. "And that’s about as challenging a situation as you’ll ever experience in operations." 9:06 a.m. The tailgating across the street from the stadium has been in full swing for hours. For Flint residents Major and Jackie White, the noon kickoff means the pre-game beverages start flowing early. "You don’t have as long to drink," Major said. "It’s a sprint not a marathon," Jackie joked. Canton resident Mark Marek and his wife have had season tickets for 36 years. Early mornings are a family tradition. "We generally bring our grandson. He’s 8 years old and he loves to get up early. He thinks he’s camping. He helps us set the canopies up, get the heaters going," he said. "These aren’t weekend memories. These are lifetime memories when you come to a U of M game. Michigan radio announcers Jim Brandstatter and Dan Dierdorf were Wolverine teammates nearly 50 years ago. They get to the press box well ahead of the game, but like the fans, they start their day outside the stadium. "First thing we do is we get up and we got to a tailgate and we visit our friends. And a lot of the former teammates of ours and former players come over and say hello,” Brandstatter said. "Tell the truth," Dierdorf said, interrupting. "We’re both terrified of doing a game on an empty stomach." 10:25 a.m. On this cold October morning, concessions workers are selling warm drinks. The kitchen staff makes about 9,000 cups of hot chocolate for a cold-weather game. They also prepare more than 18,000 hot dogs and brats and more than 10,000 pretzels, which is why some kitchen employees showed up at 3:00 a.m. today. 11:14 a.m. The full teams come on the field. Dierdorf remembers the feeling from his playing days. "Every one of those kids, they got a knot in their stomach right now. You realize where you are." 11:36 a.m. The teams leave the field. 11:38 a.m. P.A. announcement opens the pre-game festivities. "Good morning. And welcome to Michigan Stadium for homecoming and the 138th season of Michigan football!" 11:40 a.m. The band marches in. The Michigan Marching Band is longer than the stadium’s tunnel. The tail end is practically in the parking lot. After the more than 400 members get on the field, they begin their first performance of the day. 11:44 a.m. Michigan alum James Earl Jones – a.k.a. Darth Vader – narrates a pump-up video. 11:54:30 a.m. Michigan takes the field, one minute before the opposing team. 12:01 p.m. After a long morning for the Michigan Stadium staff, it's time for the kickoff. Morning Edition Producer Lauren Talley contributed to this story.